Rabbits live communally with other rabbits usually in a system of burrows known as a warren. Some or all of the entrances may be hidden away in dense vegetation. Rabbits will also live under sheds, amongst rubble and in piles of dead tree roots and branches. During the day they can often be found lying above ground in sheltered places. A fully-grown rabbit is about 40cm long and can weigh 1.2-2kg. It may eat 0.5kg of green food a day. A rabbit’s fur is generally long and soft and is grey/brown in colour and they have white under parts and a short tail. Their long ears are most likely an adaptation for detecting predators. Wild rabbits are rather uniform in body proportions and stance. Man is the rabbit’s main enemy since it has been regarded as a major pest for the last 200 years. Rabbits cause a lot of damage to crops, gardens and the countryside. Earlier this century when the rabbit population was much larger, they caused such extensive damage to crops and trees that they were included in the Pests Act 1954. In 1954, a flea-carried virus called myxomatosis was introduced to the wild rabbit population and this killed more than 95% of Britain’s rabbits. 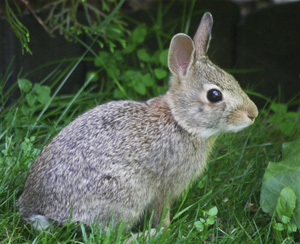 Myxomatosis is a distressing disease, affecting the eyes and brain. The drastic reduction in rabbit numbers also caused a decline in the number of foxes, buzzards and other predators as well as affecting the growth of vegetation; unwanted plants such as gorse, bramble and coarse grasses were encouraged to grow. However, rabbits are once again more common, having developed a resistance to the virus, although populations in some areas are occasionally affected by new strains of the virus. Because of natural predators such as foxes, weasels and even crows, wild rabbits have a short life expectancy of about 2 – 4 years. The main breeding season is January to July. Females born early in the year may start to breed at three to four months. The gestation period is 28-30 days, with an average of five young per litter and females may produce 4-5 litters per year. Burrows – interconnecting to form a warren system of which some or all of the entrances may be hidden in scrub. Scrapes – small excavations, usually with one or two droppings among the excavated soil. Runs – pathways where the repeated passage of Rabbits has suppressed the vegetation. Fur – either caught on fencing or thorns, or torn out during fighting. Droppings – spherical pellets 7-10mm in diameter composed largely of undigested plant remains. Latrines – heaps of large numbers of droppings. Feeding signs – grazing of vegetation and barking of shrubs and trees. Control by Gassing and Aluminium Phosphide products can be very effective when correctly carried out under the right conditions and in suitable situations. It is essential that the person carrying out the gassing is competent and suitably trained. Trapping rabbits is another alternative where gassing is inappropriate. Cage traps are commercially available from various pest control suppliers. They have proved to be very effective at controlling Rabbits. The traps should be placed in the Rabbits feeding areas and baited. Cage traps must be visited at least once and preferably twice a day. Trapped Rabbits must be humanely dispatched on removal from the traps. Cage traps can be particularly useful for catching Rabbits in confined spaces such as gardens and cemeteries. If you have a Rabbit problem in Edinburgh, Glasgow, Aberdeen, Dundee or Perth, call GRAHAM pest control today and we could help with rabbit proofing and removal.